T Racing just send one container of angle shelving to South Africa recently. From early 2006, T Racking start to export Racking and shelving to South Africa. 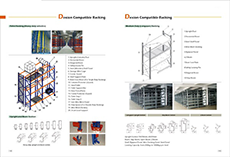 With the development of African economy, the requirements for racking and shelving is very strong. T Racking have distributors in all the major cities of South Africa like Pretoria, Cape Town, Durban…etc. Usually customer place one order with 3-5 containers of pallet racking and angle shelving. T racking thus export a lot of storage racking & shelving project to South Africa. Under the help of strong Rand, the business of customer is also very good. T Racking also develop rut shelving together with one distributor of South Africa. From later 2012, Financial crisis affect South Africa and Rand drop a lot compare with early years, this is not good for import business. Hope Rand can keep appreciating in the near future!